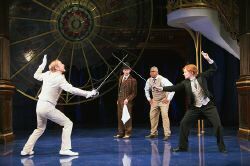 A giddy whirlwind of romance, song and dance is the production of Twelfth Night at Folger Shakespeare Theater. Music from a bygone age of glamour weaves through this story as siblings Viola (Emily Trask) and Sebastian (William Vaughan) are shipwrecked by the famous sinking of the Lusitania in the 1900s. When they are separated by the ocean, Viola assumes her brother must be dead. In mourning, Viola sees a possibility of what she could become in the figure of a noblewoman named Olivia, (played by Rachel Pickup), who has shut herself off from life and happiness because of a beloved sibling’s death. 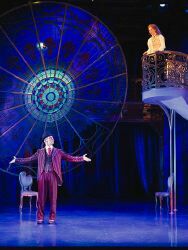 Viola decides to mourn in her own way, and enters the employ of the Count Orsino (Michael Brusasco) disguised as a man. As she plays the role of her master’s right hand page, and delivers letters to the lady Olivia on his behalf, she sees the pain and pleasure of unrequited love, and begins to fall head over heels herself. Meanwhile, her brother, Sebastian, has washed up on a remote part of the coastline and is making his way towards the city, with a loyal friend (Antonio, played by Chris Genebach) who is a wanted man. Antonio, however, promises to risk being caught so that Sebastian might have a chance to find his fortune and place in life again. As the siblings circle each other, never realizing the other is there, mistaken identities and similar conundrums arise, all story threads which must be sorted before all can be made well. This particular production took a leap into the world of music to set the stage for the play. Each song is from the early 1900s, and picked to underscore and score the tone of the play. The actors and pianist were marvelously harmonious, and the song choices were lively and entertaining. In addition, a few of the actors played instruments during the show very skillfully, such as Miss Trask, who played the cello during one of the scene changes. The set was grandiose and very much resembled parts of an upper class luxury liner. 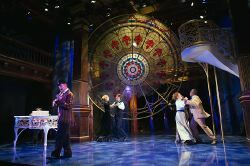 While this was in its way a little odd, considering that the play was set after the shipwreck, not before, it was beautifully done, The set included a large stained glass installation suspended from the ceiling, as well as a grand staircase and a wrought iron grand piano. The scene changes were appropriately minimal, and required only the positioning of two chairs and a bench. However, due to the songs, scene changes often took longer than it would had they just moved the minimal set dressing by itself. The acting was amazingly cohesive, with various characters and side characters stealing the show in turns. 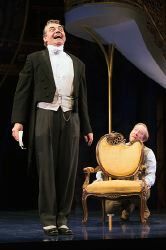 Of particular note was the spirited and transformative performance of Richard Sheridan Willis as Malvolio, a servant to the lady Olivia. He went through a marvelous range of emotions, and dominated the stage every time he stepped out onto it. 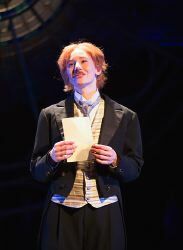 Emily Trask as Viola was a fair hand at changing her every movement to a convincing representation of a male persona, and because of that her gender deception felt very real. One could believe that the character was supposed to be a man, and she was just as real in both her masculine and feminine personas as one could wish. Requited love, heartache and redemption tie the story together at the end of the show. Overall, the energy and veracity of the cast as they showcased their wide range of talents and passions makes it a show worth seeing. 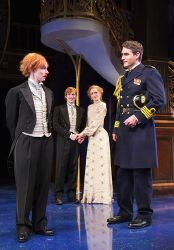 Twelfth Night is such a deliciously romantic, funny, and moving story. After the masculine and aggressive war play of Henry V, we have relished the opportunity to create a world that is so elegant and whimsical. It is a charming play about love in its many forms: unconditional love, unrequited love, self-love, compassionate love, and true love. Each character in the play seeks love in one way or another. Some are successful in their quest, and some are not. The historical traditions of Twelfth Night, the last celebration of the Christmas holidays, including the Lord of Misrule, role and gender reversal, and the topsy-turvy nature of servants becoming the masters, would have been understood by Shakespeare’s audience. This leads us to ask: what and where is Illyria today? The creative team and I set about finding a world in which the moral, ethical, and social status of the play would come to life, and we landed somewhere at the beginning of the 1900s. The play conjures a world that cannot move forward without a catalyst, a world where change had to take place, a world that, despite how hard characters may resist, could not avoid the ebb and flow of fate or of time. We began discussing geographical sites known for their ship wrecks and coastlines that remain remote, mystical, and dangerous. Our research drew me towards the sinking of the Lusitania off the southern coast of Ireland in May 1915. The notion of the class distinction onboard a luxury cruise liner, the right of passage of crossing the Atlantic, and the enforced equality of the passengers on board a ship that was sinking all begin to solidify in our thoughts. And placing the story in this time allows us to explore the musical highlights of the popular tunes and the classical composers of the day. Music, which is a fundamental ingredient to this story, has given us a springboard to dive to the emotional depths of the play and allow this multi talented cast an opportunity to sing, dance, and play musical instruments in the true nature of an ensemble. With all this in mind, I began to think about the subtitle of the play, What You Will, and I thought perhaps at in this love-seeking, love-needing world that might be better thought of as: What You Wish. Our Illyria is a place where fantasy and reality collide, but class distinction and gender blur, and love is a currency that everyone seeks. It is, like all great Shakespeare plays, ambiguous, and we hope that you will take from it what you wish. This article can be linked to as: http://showbizradio.com/go/9435.